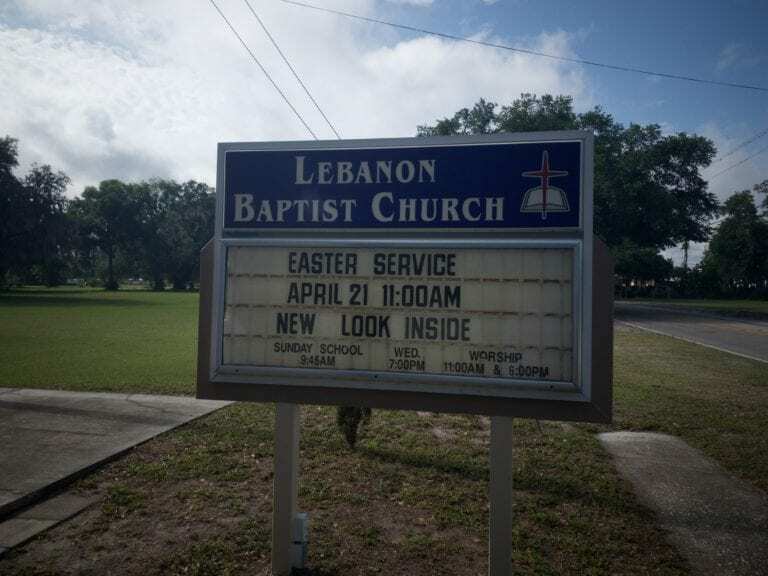 Lebanon Baptist Church is undergoing a revitalization to symbolize the new, deep-rooted mission of the congregation. It’s a trend Pastor Timothy R. Partridge knows all too well. People grow up in church, fall in love with the community, are hurt by either their fellow members or religious leaders and walk away trying to mend their wounds on their own. Society is turning away from religion. He knows because he was one of the many that closed that door. It wasn’t until his children were saved that he began to make his way back to the faith he had turned away from. Within six years he was ordained and four days later he did his last shift on an ambulance. Breanne Williams. Pastor Timothy R. Partridge is hoping to serve those who have been hurt by church. He soon became the pastor at Lebanon Baptist Church and when he began to listen to different members and people in the community, he realized there were many like him that had suffered wounds from their congregations. His mission was suddenly clear. Lebanon became “The church for those hurt by church” and opened its doors to anyone and everyone, even those who were confident they would never fit in a traditional church setting again. When he came on as pastor he said the church was at a crossroads. While at one time it had been a thriving congregation, its numbers had dwindled and few new members ever came through the door. It was dying and needed to decide if it would become a replant or if it would undergo an entire revitalization. They prayed, did a hard analysis and decided it was time to buckle in and start anew. Courtesy of Pastor Timothy R. Partridge. The old decor was bright yellow and royal blue, matching Turkey Creek’s theme. For three and a half years they worked on metaphorically rebuilding from the foundation up and eventually they agreed it was time to show that change with a fresh look. Since the 70s, Lebanon had been known as the little white church with the blue door. Because so many of its original members were Turkey Creek alumni, the colors inside the building were just as bright. Royal blue carpet and yellow pews filled the sanctuary and, despite a fire in the 80s that caused some repairs, there had never been any major renovations to the structure. The current church was built in 1954, though the congregation had been meeting on a portion of the property since 1941. They were a church plant from Bethany Baptist and their reputation soon transformed into being a structure of longevity. In 77 years they only had 12 pastors. Those who came, stayed. Offering a solace so many fail to find in other churches. Breanne Williams. The blue door and white trim are long gone thanks to recent renovations at Lebanon. The white paint has been stripped and replaced with a beige coat. When you drive up on Lebanon now it blends in with the rest of the neighboring community, which Partridge said was the mindset of the renovation. Walking inside the blue carpet is gone, as are the pews. It’s modern, its warm and the hope is it will symbolize a fresh start and a fresh perspective for the congregation. The new focus is for the church to get outside its doors, to reach out to the community and meet people where they are. Down the road they hope to start the “three Cs” program — community, coffee and conversations — where people can come on a designated day and just sit back, enjoy some free coffee and take part in conversations with each other, regardless of if they share similar views or not. Easter Sunday the church is holding a grand reveal. Sunday school is at 9:45 a.m., the morning service is at 11 a.m. and the evening service is 6 p.m. On Wednesdays the church has a 7 p.m. service as well. It’s first big outreach event is a chili cook-off that will be held from 3 p.m. to 6 p.m. May 18. Everyone is welcome to attend and there will be lots of fun for the entire family. Visit Lebanon Baptist Church’s Facebook page, check out lebanonbaptistplantcity.com or email Partridge at pastor.lbc@outlook.com.